Insights: Ideal for business Travellers, couples or the lone traveler. Debating between the comfort of a luxury hotel and the thrill of an authentic accommodation? You will get the best of both worlds with the luxurious vacation apartment. 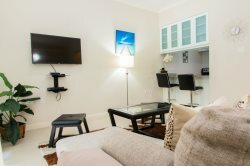 Located in the heart of Kingston city our sophisticated apartment boast all the amenities you would expect from a hotel, including attentive staff, high speed WIFI, Infinity Pool, Mini Golf, Gym, Smart TV, hot and cold water, AC and much more. At the same time you can live like a local by taking advantage of the fully equipped kitchen and the privacy of our tucked away secure location, smack dab in the middle of Kingston, Jamaica’s business, commercial and party hub. 20 South is a centrally located community with a a high-rise apartment block. The grounds, common areas and buildings are excellently maintained. The complex is a gated residential community with 24 hours manned security. This unit comes with private laundry facility, equipped with washer and dryer. Also located on property is a communal infinity pool, Gym, Roof top Jogging Trail, Roof Top Mini Golf putting course, Outdoor grill and party area. This beautiful one bedroom Kingston, is located in a brand new secured, residential development situated along South Ave within walking distance from Kingston’s major retail hub, Half Way Tree and Jamaica’s business district, New Kingston. That’s not all! You will be just a stone’s throw away from the world renowned Devon House Heritage Site which is one of Jamaica’s leading and most popular national monuments and symbol of the cultural diversity that makes this island a unique and preferred choice for vacations. Devon House features 11-acres of lush sprawling lawns and offers an enviable shopping experience, especially, the most sought after, Devon House Ice Cream. If you enjoy shopping, you’ re in luck because Mega Mart, one of the country’s largest supermarkets and department store, is located only 5-minutes walk away from the vacation rental. Right beside Mega Mart, you will find a business and entertainment center that features various businesses and night clubs such as Peppers. For all you Canadian and German nationals, you will love the fact that both Embassies are only walking distance from your complex. Just 2-minutes drive from the complex you will also find the Andrews Memorial Hospital which is a privately owned hospital that features a Dental Centre, Intensive Care Unit, Imaging Unit, Maternity Unit, Operating Theatre, Pharmacy, In-Patient (private rooms), Outpatient Department, US Medical, and a Vegetarian Café. So you have access to good health care while in the island. Located within 5-10 minutes walking distance from: Half Way Tree Shopping Malls, Restaurants & Bars, parks, Devon House, Movie cinemas, Supermarkets, Gym, Embassies, Shopping Mall, Business Centres, Night Clubs, Hospitals, Police Stations and Fire Stations. This vacation rental conveniently located in the heart of Kingston, Jamaica is ideal corporate housing for the business travelers and for those adventurous island hoppers. This unit is ideal for anyone who is serious about quality amenities and luxury. It’s your five star- hotel for five times less. You're in for a treat as this one bedroom vacation condo is managed by Prohomesja, so book this fabulous vacation home and be assured that you booked your holiday with someone that takes your enjoyment as seriously as you do. Please note that check in is at 4:00 pm and checkout is at 11:00 am. If for any reason you are unable to make these times then please contact us to make alternative arrangements.